Fancying a cocktail whenever, wherever? Then let’s take a look at our portable picnic cocktail sets so you can make your favorite tipple anywhere. Our guide includes six of the best picnic cocktail sets you can buy today. We’ve chosen great quality, top value packs that see you making delicious cocktails with ease and style wherever you are. Our first entry is this rather attractive black Franmara cylinder which measures a compact 6.5” diameter and a whiskers under 12” in height. This solidly made leatherette canister has a double top and base with Velcro fastenings. The inside lining is a soft-touch velvet which looks and feels plush and offers good padding. The Franmara Barmaster’s Pro Bar Travel Set includes seven stainless steel pieces, all of which are securely fastened in by snap fit straps. You get an 18 oz cocktail shaker, double jigger, ice tongs, strainer, bar spoon, muddler and a handy corkscrew. The tools are of a decent quality, durable and functional which we think is more than acceptable for a portable set. The James Scott set opts for a more traditional carrying case – an aluminum beauty with reinforced corners and handle. The case measures 11.5” x 9.5” x 5” and is compact and sturdy. Inside you’ll find a vintage chalkboard style list of eight popular martini drinks including recipes for vodka martini, grasshopper and cosmopolitan. 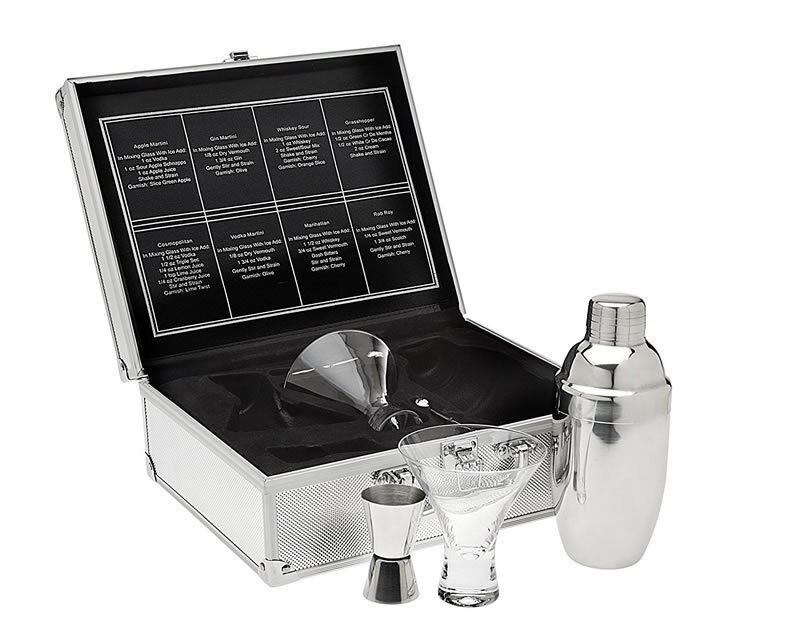 The set contains a stainless steel 16.5 oz shaker, a pair of martini glasses, a pair of cocktail picks and a double jigger. It’s not the most comprehensive kit out there but it’s adequate for most your needs al fresco. Everything is housed in its own compartment so you needn’t worry about anything getting damaged on your trip. The case even has a blank metal plate giving you the opportunity to have it engraved as a gift. 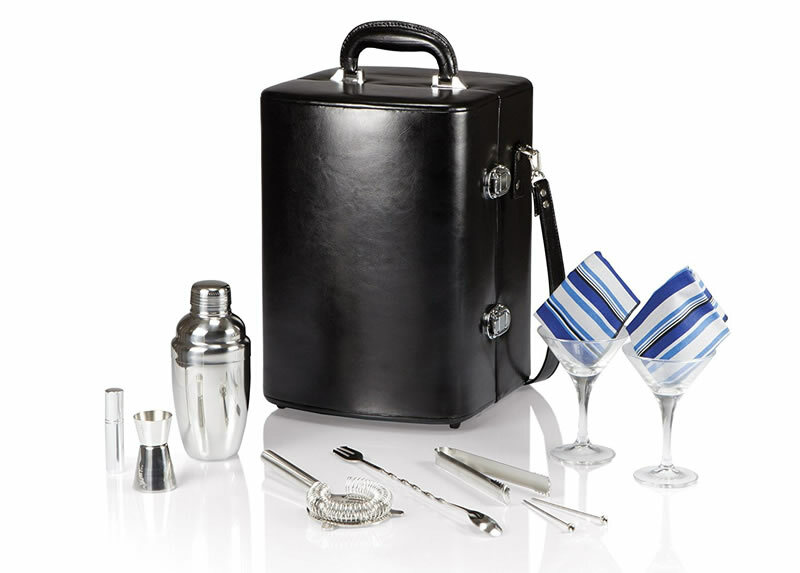 LIQUID LUNCH FOR 2 MARTINI SET - This cocktail set comes in a chic aluminum carrying/storage case and is great to take along on outings, or to use at home. 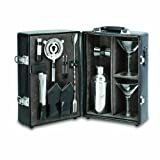 The inside of the case has a black chalkboard style list of 8 of the most popular martini recipes. 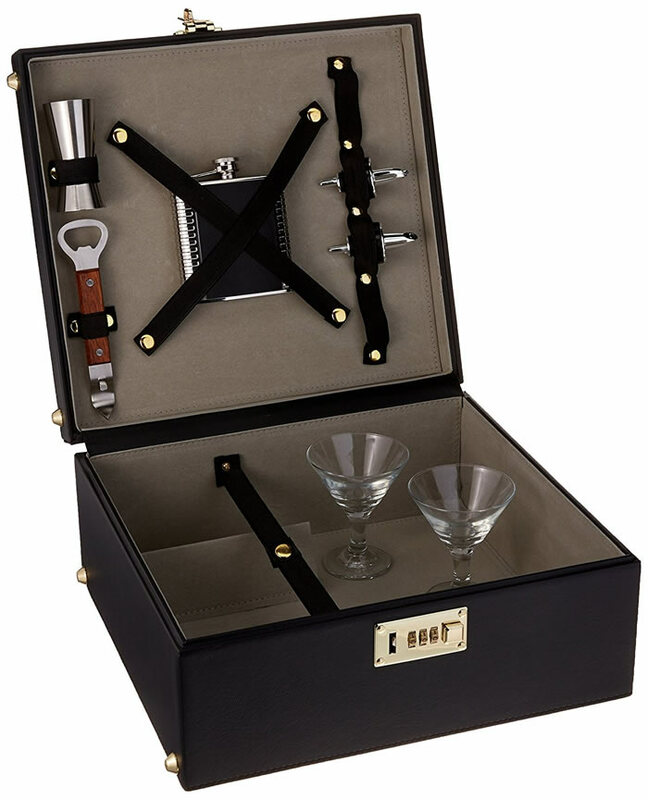 FUNCTIONAL COMPARTMENTS - Can safely keep all bar tools and martini glasses to avoid breaking. Premium & sturdy quality! EASY & FUN - Sure you can put beers in a cooler for that picnic, but where's the fun in that? This Liquid Lunch martini set offers you a much classier alternative. Equipped with a jigger, cocktail shaker and two martini glasses, it's a great bit of barware that you can take with you. Throw it in your car before your next trip to the park. Contains everything you need to easily pour yourself a drink! A total party-on-the -go! Perfect for any occasion and an excellent gift too! The smart, clean lines of this stylish black case house a remarkably well-laid-out array of cocktail paraphernalia that will stand you in good stead when out and about. It’s a robust case and features a combination lock to keep out envious hands or minors. The Concession Express handle has a nice feel to it, solid but with a pleasant softness to its cover and it’s also well-mounted to the case so as not to give you any worry over it coming away when you have it stocked. Opening the executive style case treats your eyes to a velour interior that boasts a substantially secured very attractive 6 oz serving flask with a metal and black trim. Two good quality martini glasses are included along with a bottle opener, the essential 1.5 oz double jigger and a pair of speed pourers. There is space for three standard fifth size bottles but our big miss is a cocktail shaker which isn’t supplied. However, one of the bottle spaces can be given up to accommodate one from your own collection. If you have a bit more disposable income then the Manhattan from Picnic Time is definitely worthy of your consideration! 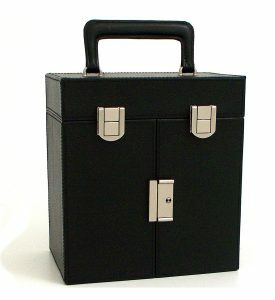 Available in black (like the set we received) or in mahogany and tan this is a fabulous-looking case. It’s premium leatherette with an excellent-quality suitcase-style handle. It measures 14” x 10.5” x 10.3” allowing for a generous interior volume while still being easily portable. It comes with an adjustable, detachable shoulder strap which we think is a good accessory that affords you a bit of extra carrying flexibility. Inside you’ll find a rich velveteen lining and separate compartments that keep your tools, bottles and glasses securely organized. The set comes with two 7 oz hand-blown martini glasses, Cobbler shaker, double jigger with 1 oz and 2 oz measures, ice tongs, strainer, stirrer, Vermouth mister and olive picks. A pair of cotton napkins is included too! The insulated compartment can take two standard size spirit bottles. To top it off the set comes with a ‘built-to-last’ lifetime guarantee. It also can be monogrammed to be given as a rather fine gift. The Legacy pack commands a higher price bracket but, boy is it worth it! 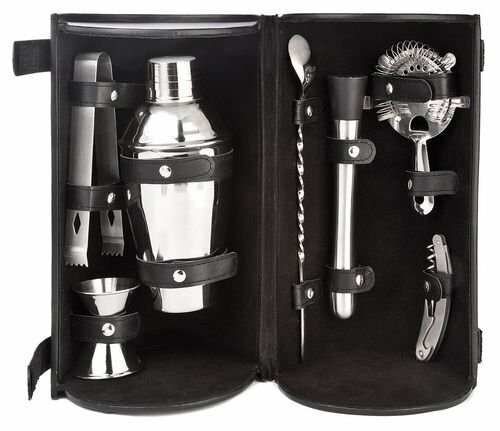 This is a more than a portable cocktail set – it’s a fully featured portable bar. 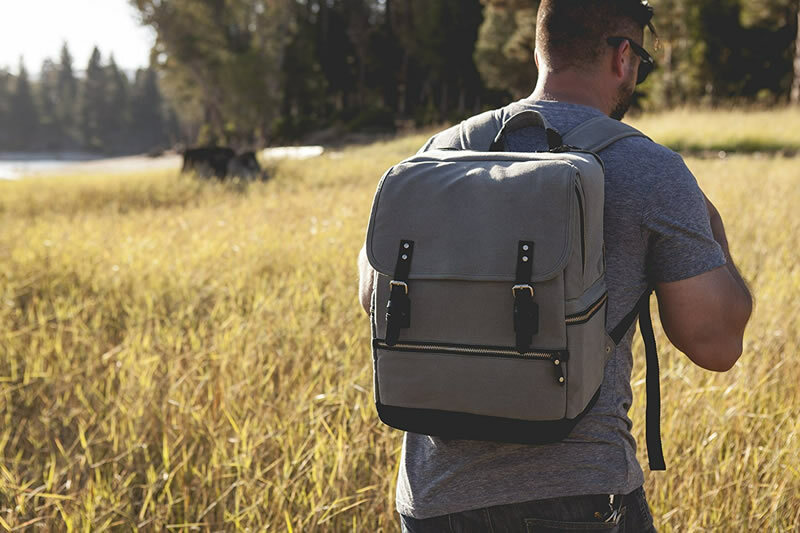 Designed inside and out to be among the best of its kind, this robust backpack sports a waxed cotton shell making it splash proof and dirt resistant. It’s padded inside so it can handle the rough treatment that comes with being toted about. It’s also insulated which is great for keeping your ice and liquor cold. The pack features a zippered front pouch with compartments that will house your cell phone, keys and wallet. We love the thought that has went into this set; for example the side pockets include a small, 6”square cheese board! Before we talk about the equipment, it’s worth noting just how spacious this pack is. There is room for three bottles of your favorite tipple. Inside the main compartment is a removal bar tools organizer and it’s here that the Legacy continues to excel. First off there is the stainless steel 24 oz/16 oz Boston shaker with its brushed metal finish and polished interior. Then we have the Hawthorne strainer, ice tongs and double jigger (1.5 oz/ 1oz). A muddler with a plastic head, waiter’s corkscrew, six cocktail picks, fork-tipped paring knife with serrated edge and a combination can and bottle opener make up the set. Topping off this incredible package is Picnic Time Family of Brands lifetime guarantee. So if you want to experience the best outdoors cocktail experience, with attention to detail, and the reassurance that it’s money well spent then we heartily recommend this bar backpack. From the rugged backpack to the elegant black leather of a portable drinks cabinet, the Kensington Row case features a beautifully stitched, high quality exterior with stylish steel clasps and a lockable drinks compartment. 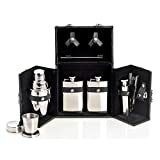 Also occupying a premium price and deservedly so, this set makes for a fabulous gift to yourself or the cocktail lover in your life. Opening the case is to look inside something that wouldn’t be out of place in a James Bond film. 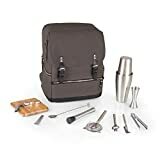 This classy, polished, stainless steel ten-piece travel bar boasts a pair of 4 oz flasks, a 2 oz flask, a 7 oz cobbler cocktail shaker, a flask funnel and a wiping cloth. Accessories include a stirrer and ice tongs. We love the collapsible cups that look stylish and also help keep this case compact. The case only measures 7.5” x 7” x 4.5” and is easily carried by its luggage-style handle. Each accessory and tool is securely fastened in with button-down straps.